As the renewal of glory and the memory of human’s correlation with nature, Nowruz (Iranian New Year) is one of the most important annual festivals, with its own unique customs, and has been celebrated for thousands of years. Nowruz is the first day of Persian solar year, and one of the oldest celebrations of the ancient Persia, originated from ancient Iran and is still celebrated in several areas of the Iran’s plateau at the beginning of the spring. The glorious ceremony suggests the radiant manifestation of the homeland and the rich culture of the Iranian people. Setting the table of Haftsin in Iran, Azerbaijan and some areas of Afghanistan is a common tradition. The Haftsin table includes seven items starting with the letter of 'S' or Siin in the Persian language. Nowruz table is one of the common rituals among the people who celebrate Nowruz. 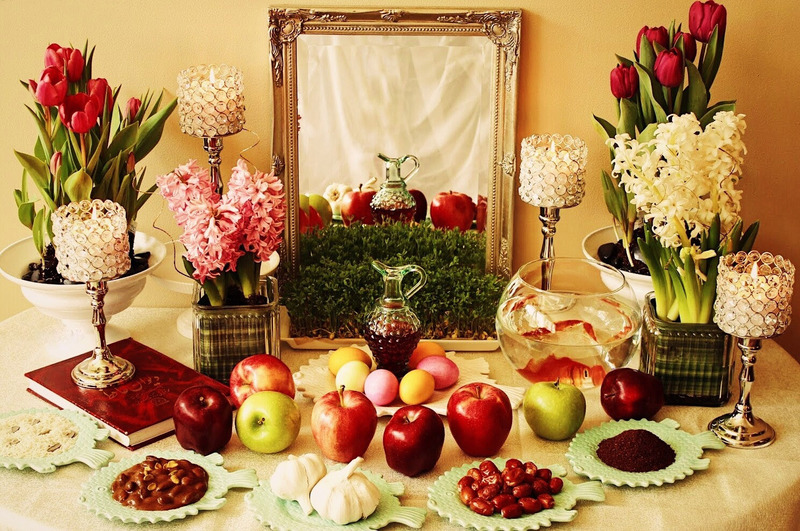 In this way, seven things started with the letter of S (letter of Siin in Persian) are placed among the table like vinegar, fruit of oleaster tree, coin and apple with particular rituals. Mirror is put on the table as a sign of lighting, candle as a sign of light and glow, a bowl of water as a sign of purity and Hyacinth is used for the table beauty. The painted eggs and goldfish are used to decorate the table. After the advent of Islam in Iran, the holy book of Qur'an is also placed on the table of Nowruz. All seven items on the table carry a special meaning. For example, the apple is a symbol of beauty and healthiness; fruit of oleaster tree is a symbol of love and affection, wheat as the green environment, coin representing wealth and garlic as a symbol of healing and health. Happy Iranian New Year from Uppersia to all of Persian all around the world . The table of Haftsin in Iran, Azerbaijan and some areas of Afghanistan is a common tradition.